In our modern-day, throwaway culture, consumers often give little thought to the items they discard or where their so-called "garbage" ends up. Former U.S. Poet Laureate Ted Kooser writes the story of one yellow plastic bag, the journey it takes, and the value and use it still holds. As with all of Kooser’s writing, the depth of thought, care, and emotion put into each word show the skilled hand of a master writer at work. 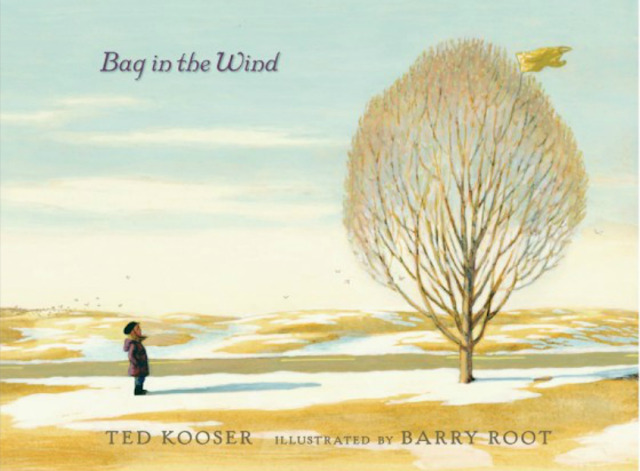 The story is simple enough to capture the attention of a small child as they read about the bag, the wind, and the landfill from which it flies, while poignant to audiences of all ages as we consider the impact we have on the environment. Barry Root’s illustrations are a beautiful compliment to Kooser’s equally lovely prose and significant message.